Magnificent Marie Curie Quotes from YummyQuotes.com! These prize-winning Marie Curie quotes and quotations are sure to satisfy the most inquiring mind! Marie Curie was one of the greatest scientists to ever live, and the first person—let alone the first woman—to receive two Nobel Prizes. 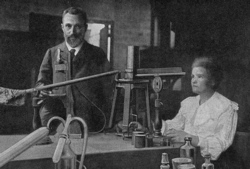 Together with her husband, Pierre Curie, and the French physicist, Henri Becquerel, Marie won the Nobel Prize in Physics in 1903. This was the first time a woman was awarded the Nobel Prize. Then in 1911, she won a second Nobel Prize—this time alone, and for her work in chemistry, making her the first person in history to win two Nobel prizes. Born in Poland under the rule of Tsarist Russia, Marie grew up knowing the authorities could punish her for speaking Polish, and probably come after her parents, too. And she was no stranger to personal tragedy. Her oldest sister died when Marie was eight. Two years later, her mother died. Marie spent many hours crying in the corner of her room. When she grew older, the parents of her first love forbad them to marry because she was penniless. Her family was poor. It took Marie years to save enough money to travel to Paris to pursue her beloved education. Then when she applied to Poland’s Kraków University to continue her studies, they refused her, because she was a woman. - Believe me, family solidarity is after all the only good thing. - I was taught that the way of progress was neither swift nor easy. - All my life through, the new sights of nature made me rejoice like a child. - First principle: never to let one’s self be beaten down by persons or by events. - There are sadistic scientists who hurry to hunt down errors instead of establishing the truth. - I am one of those who think like Nobel, that humanity will draw more good than evil from new discoveries. - Our society, in which reigns an eager desire for riches and luxury, does not understand the value of science. - I have frequently been questioned, especially by women, of how I could reconcile family life with a scientific career. Well, it has not been easy. - Science is essentially international, and it is only through lack of the historical sense that national qualities have been attributed to it. - Nothing in life is to be feared, it is only to be understood. Now is the time to understand more, so that we may fear less. - The life of a great scientist in his laboratory is not, as many think, a peaceful idyll. More often it is a bitter battle with things, with one’s surroundings, and above all with oneself. - Between the days of fecund productivity are inserted days of uncertainty when nothing seems to succeed, and when even matter itself seems hostile; and it is then that one must hold out against discouragement. - It is my earnest desire that some of you should carry on this scientific work and keep for your ambition the determination to make a permanent contribution to science. - Life is not easy for any of us. But what of that? We must have perseverance and above all confidence in ourselves. We must believe that we are gifted for something, and that this thing, at whatever cost, must be attained. - There were some very hard days, and the only thing that softens the memory of them is that in spite of everything I came through it all honestly, with my head high. - I have no dress except the one I wear every day. If you are going to be kind enough to give me one, please let it be practical and dark so that I can put it on afterwards to go to the laboratory. - I am among those who think that science has great beauty. A scientist in his laboratory is not only a technician: he is also a child placed before natural phenomena which impress him like a fairy tale. - You cannot hope to build a better world without improving the individuals. To that end each of us must work for his own improvement, and at the same time share a general responsibility for all humanity, our particular duty being to aid those to whom we think we can be most useful. - I think that we must seek for spiritual strength in an idealism which, without making us prideful, would oblige us to place our aspirations and our dreams very high—and I also think it is a source of disappointment to make all the interest of one’s life depend upon sentiments as stormy as love. - I shall never be able to express the joy of the untroubled quietness of this atmosphere of research and the excitement of actual progress with the confident hope of still better results. The feeling of discouragement that sometimes came after some unsuccessful toil did not last long and gave way to renewed activity. - What concerns me is I will never forget my gratitude to my dear father for what he has done for me, and he has done a great deal. My sole regret is that we cannot repay our father for what he has done for us. All we can do is to love and respect him as much as is humanly possible. - Sometimes my courage fails me and I think I ought to stop working, live in the country and devote myself to gardening. But I am held by a thousand bonds, and I don't know when I shall be able to arrange things otherwise. Nor do I know whether, even by writing scientific books, I could live without the laboratory. - All my mind was centred on my studies. I divided my time between courses, experimental work, and study in the library. In the evening I worked in my room, sometimes very late into the night. All that I saw and learned that was new delighted me. It was like a new world opened to me, the world of science, which I was at last permitted to know in all liberty. - It may be easily understood how deeply I appreciated the privilege of realizing that our discovery had become a benefit to mankind, not only through its great scientific importance, but also by its power of efficient action against human suffering and terrible disease. This was indeed a splendid reward for our years of hard toil. - Ah! how harshly the youth of the student passes, / While all around her, with passions ever fresh, / Other youths search eagerly for easy pleasures! / And yet in solitude / She lives, obscure and blessed, / For in her cell she finds the ardour / That makes her heart immense. - Humanity needs practical men, who get the most out of their work, and, without forgetting the general good, safeguard their own interests. But humanity also needs dreamers, for whom the disinterested development of an enterprise is so captivating that it becomes impossible for them to devote their care to their own material profit. Without doubt, these dreamers do not deserve wealth, because they do not desire it. Even so, a well-organized society should assure to such workers the efficient means of accomplishing their task, in a life freed from material care and freely consecrated to research.